That was on of the first computer program that I ever wrote. It came straight out of the programming manual that came with my Color Computer 2 (CoCo 2). Actually, I had just watched War Games with Matthew Broderick a couple of weeks before and was pretty disappointed that this thing didn’t include an AI interface. My father brought me this few hundred dollar toy that changed my life forever. I was in 5th grade and wanted to be a chef to this point in my life. I loved baking and thought that was what I wanted to do for sure. That was until that faithful Christmas and I hooked my computer up to my black and white 13” TV via an RF modulator. My dad spared no expense. He had no idea what he was buying and got the tape drive so I could save my programs. He had no idea of what a tape drive did. I gradually got better at programming. By far the most complicated application I wrote on my CoCo was a hit the target game. I spent many of nights debugging code so long that my father would come wake me up the next morning for school with the machine in my lap. This eventually grew to my x86 (8088) programming experience where I actually made computer games that worked their way across my high school campus. There’s something uniquely satisfying about walking into the computer lab and seeing the jock playing a game I developed using ASCII graphics. I even had a psuedo little software company that I was in competition with my best hacker friend. The name of my company was H.A.C.K. (Hackers Against the Common Knerd) Software and my buddy Sheldon Pasciak’s company was Dog Star software (I know lame). I probably couldn’t program my way out of paper bag today. I’m completely an infrastructure guy now. Of course I’m completely comfortable with a command line; that is when anyone is naive enough to let me get in front of a production machine anymore . But, outside of the occasional script no programming for me. I’m so grateful to my dad for his sacrifice and investment. This is one of the reasons I blog. To pay it forward. So you can thank my dad for all the technical posts. This is so awesome. 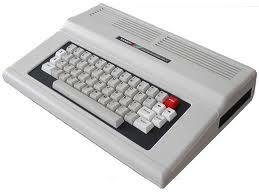 My mom bought us a Commodore 64 off of someone on the street (we never asked how or why it went this way, knowing she didn’t want to discuss). Not sure how much she paid for it, but because she got it that way, she allowed us to tear it apart into pieces and rebuild it. It transformed three of her four kids (a data center manager, a developer and a tech writer). The best way to arm a kid for the future is to drop tech into their laps and encourage them to deconstruct. Rivka, that’s an awesome story. I sometimes forget how much I learned with breaking stuff my parents brought me being curious. I have to remember to be as understanding.